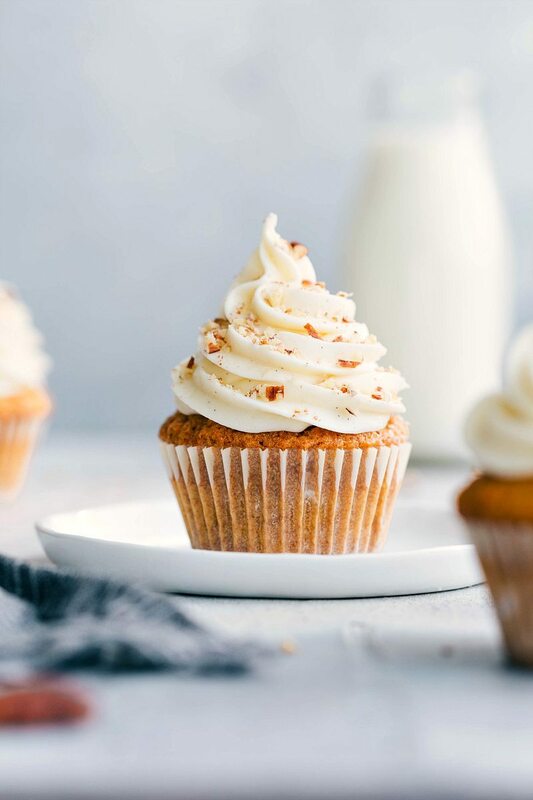 Flavorful, soft, and moist carrot cake cupcakes with the best cream cheese frosting! 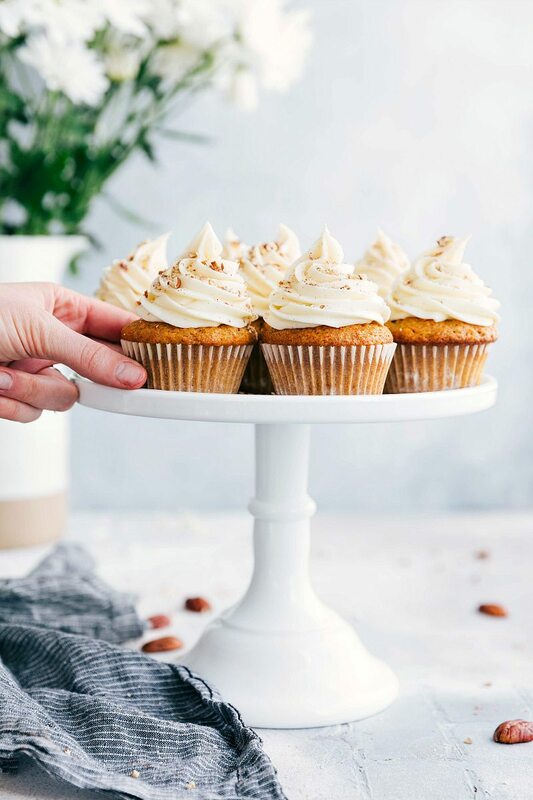 These Carrot Cake Cupcakes are one of my family’s favorite treats and everyone that tries these goes crazy for them! My dad’s all time favorite dessert is carrot cake and after spending literally years perfecting my carrot cake recipe I thought I’d tweak it a bit to create some perfectly moist, tender, and flavorful carrot cake cupcakes. 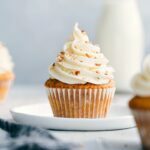 How do you make easy and moist carrot cake cupcakes? Start with room temperature ingredients. It’s important for the final texture of these cupcakes that all of your ingredients are room temperature. (That includes the butter and cream cheese for the frosting!) 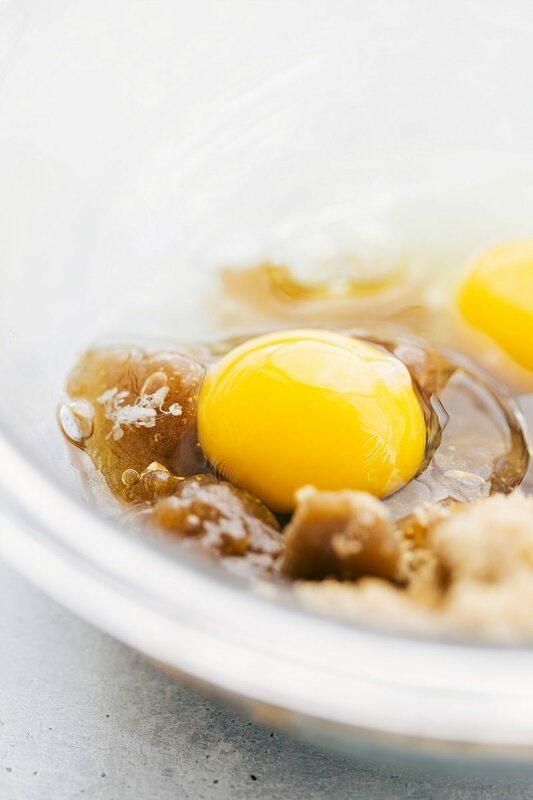 For the cupcake batter: Using room temperature eggs ensures that the eggs disperse more evenly into the batter giving these cupcakes a lighter texture (the eggs trap air). Soaking refrigerated eggs in a bowl of warm (not hot) water for about 10 minutes is a quick way to do this. Otherwise, pull the eggs out about 30 minutes before use. (You’ll also want the applesauce and carrots at room temperature). Once you’ve got all of your ingredients together and at room temperature, these cupcakes come together quickly and you’ll be amazed how easy they are to make! Start by mixing together the dry ingredients. When you measure the flour be sure to spoon and level the measuring cups so you aren’t adding in too much or too little flour. Too much flour and you’ll get dense cupcakes and too little flour and these cupcakes will likely sink and be too wet. Next, combine the wet ingredients: whisk everything together: the brown sugar, white sugar, eggs, applesauce, vanilla, and oil. Once these wet ingredients are combined and smooth, you’re ready to combine mixtures. Pour the dry ingredients on top of the wet and add the carrots on top of that. Stir everything until JUST combined. If you over mix or beat the dry and wet ingredients you’ll end up with dense cupcakes. While the cupcakes are baking, you can whip together the cream cheese frosting which comes together in minutes. The best tip I can give for the perfect frosting: make sure the cream cheese and butter are both the same temperature (room temperature). They’ll cream together nice and smooth giving your frosting the perfect foundation. How many calories are in carrot cake cupcakes? I’ve included a full nutrition breakdown for these cupcakes below the recipe if you’re interested. The total caloric amount for one cupcake is 220 calories. This does not include the frosting as that will change depending on how much frosting you use per cupcake. The frosting recipe below makes enough to add a sky-high amount of frosting to each cupcake (exactly what is pictured in these photos). If you want less frosting, cut the frosting recipe in half. How long do you bake mini carrot cake cupcakes? If you want to make these cupcakes in a miniature muffin tin instead of a regular muffin tin, you’ll want to make sure to still use paper liners and you’ll bake them around 10-15 minutes. Check the cupcakes around 10 minutes. You can test for doneness by sticking a toothpick in the center of a cupcake. If it comes out clean they are done and if it comes out wet you can add a few minutes! How do you store carrot cake cupcakes? Honesty these cupcakes (and the frosting) are even better the second day! The flavors from the spices have intensified by day 2 so don’t stress about having to make these the same day as an event! For any cupcakes that don’t get eaten, store them in an airtight container in the fridge. These cupcakes are best within 3-4 days of being made. If you want to make a candied carrot peel for the top of your cupcakes, check out that recipe here! Preheat oven to 350 degrees F. Line a 12-cavity muffin pan with cupcake liners and set aside. In a medium-sized bowl, whisk together the flour, baking soda, baking powder, salt, cinnamon, nutmeg, ginger, and cloves. Set aside. In a separate large mixing bowl, using hand mixers, beat together the brown sugar, white sugar, and eggs until combined. Mix in applesauce and vanilla extract. With mixer running on low speed, slowly pour in vegetable oil and mix until combined. 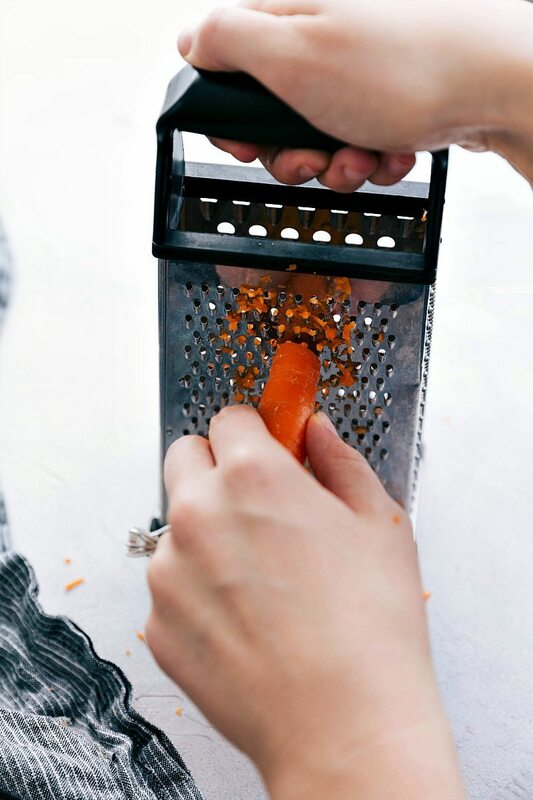 Finely shred the carrots (on the small side of your grater (picture above) and measure to ensure you have 1 and 1/2 cups. Add the dry ingredients right on top of the wet ingredients and the shredded carrots right on top of that. Stir until JUST combined being careful to not overmix. Pour batter into the prepared muffin cups, filling each cup about 3/4 full. You should use all of the batter between the 12 cavities. Bake in preheated oven about 18 - 22 minutes or until a toothpick when inserted into center of cupcake comes out clean. Cool in muffin tin several minutes then transfer to a wire rack and cool completely. Meanwhile, prepare the frosting. Using a hand mixer, cream together the room temperature butter and cream cheese on medium-high speed until completely smooth. Mix in vanilla extract, sea salt and cinnamon. With mixer running on low speed, slowly add powdered sugar and beat until well blended and smooth. Chill the frosting while the cupcakes finish cooling. Frost completely cooled cupcakes with cream cheese frosting and if desired, sprinkle crushed pecans on top. Oh, my – these look dangerous! You must have the best holidays at your house. So creative. Wow! I wish I had gran kids so I could make these! Adorable! Could I substitute the applesauce with crushed pineapple? That is what I usually add to my carrot cake recipe and it makes it very moist. I haven’t personally tried it but I don’t see why it wouldn’t work just fine 🙂 Enjoy! 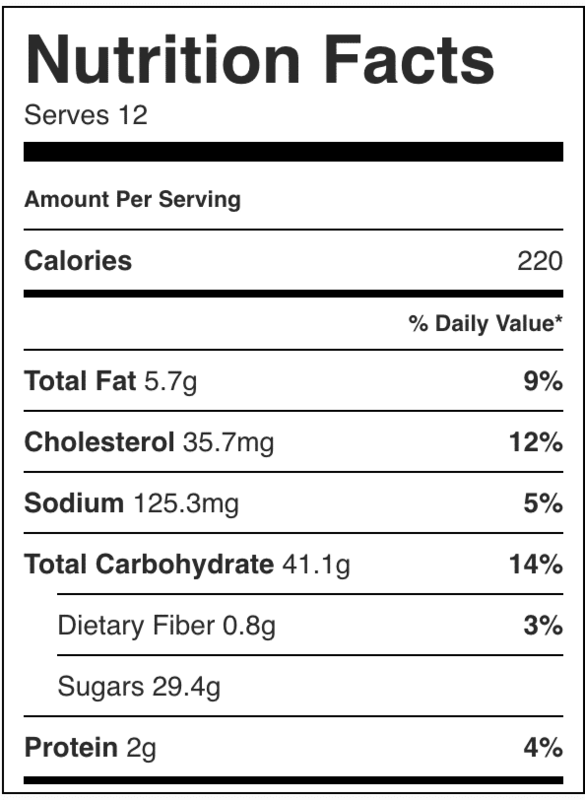 If I wanted to add raisins what would you recommend the measurement to to be? WOW!! Best carrot cake cupcakes I’ve ever had and I’ve tried dozens. Carrot cake is my favorite too. Thank you for sharing your recipe! Can you use a stand mixer for these or is it better to use a hand mixer? Thanks! Really looking forward to giving these a try! You can use either 🙂 I prefer the hand mixer for these, but both work great! These look amazing. I’m in search of a carrot cake that I can make vegan for my daughter’s first birthday. She’s allergic to dairy and egg. Do you know the substitutions I can do to make this recipe vegan? Thanks! Unfortunately I can’t give you a solid recommendation without testing myself and I’m not as familiar with vegan desserts. I wish I could be more help! Has anyone tried freezing them & did that work well if so? Hi Jackey! My altitude is 4,272 ft 🙂 Enjoy! I want to try these, but I am not sure I can find cream cheese. Mascarpone would work? I tried these – cupcakes came out great but my icing was very runny, I followed the recipe and even added a bit extra icing but it just ran off the cake. What could I have done wrong? Hey Shannen; did you by chance melt the butter or cream cheese at all? And you for sure had the right amount of both? Hi! In terms of storage for using the next day I want them nice and moist.. so do I store the cupcakes out of the fridge and pipe the icing right before serving? What size cupcake pan are you using? They don’t appear to be miniature 1 in, so out of three typical commercial sized pans would you say the middle size? Thanks!